1. Embrace Symbiosis: During the course we emphasized the concept of mutually beneficial relationships. Bacteria, plants, and fungi, used in concert, provide benefits and facilitate interactions among members of these biological groups. We also dove into metaphors inherent within the concept of symbioses. As mindful citizens, activists, and remediators, we can tap into mycelial metaphors and be mindful of abundant symbiotic relationships found throughout both social and ecological communities. ​4. Personal resilience is incredibly important: You may have difficulty healing the Earth, or addressing the root causes of oppression, if you are unhealthy or have avoided the root causes of disease within yourself, your family, or within your network. While working with pollutants, we are vulnerable to toxin exposure. Therefore, we must use personal protective equipment to safely operate in exposure zones, and provide this gear for our team. So what can we do? Our role, as remediators and fungal ecophysiologists, is to help prepare the microbial community and the mycelial network to survive, thrive, and interact with their environment. A course participant, and new friend, also proposed the term “transmogrification” in lieu of “degradation;” both of these proposed terms: “priming” and “transmogrification” emphasize the fact that environmental remediation and biodegradation are not the end of the cycle. Ecosystems are ever-changing in their transfer of nutrients. Living organisms which occupy spaces may already be priming the area for the succession of plants and animals to return, after the impact of human interference is ameliorated. This ​illuminates our role in the cycle. In ones of the presentations, our facilitator Mia Maltz demonstrated through her research (published in the open access journal PloS One) that habitat fragmentation affects fungi and ecosystem functioning, such as the ability of fungi to produce extracellular enzymes and to decompose plant litter. As fragmentation affects fungi and decomposition, we, as remediators, may assist the succession of evolution by introducing microbial and botanical allies and via creating the conditions conducive for supporting life. We can facilitate these processes by using organic debris and microbial inoculants, such as compost teas or microbial mulches, as well as revegetation, coupled with complementary techniques to foster the remediation of degraded landscapes. As we look back at our last year, we are grateful for our amazing team, and our amazing supporters like you! As we look forward into the new year, we plan on seeing many of our projects come to fruition, but we’ll need your help to get there. Your contributions directly support the bioremediation research that is crucial to cleaning up oil spills in Ecuador and beyond, food sovereignty, and sustainable job creation. -Catalyze the development of additional municipal bioremediation systems. How Can You Help Us Get to our 2018 New Years Resolutions? We are pleased to announce that Donald is our new On-site Operations Consultant! Donald has been involved with CoRenewal since its inception, and we are honored to be working more closely with him and UDAPT, the incredible organization he represents. Donald is the Subcoordinator of UDAPT and Coordinator of Remediation Projects under UDAPT. UDAPT seeks justice for the more than 30,000 people affected by Chevron’s oil pollution, including the Scionas, Secoyas, Cofan, Waorani, Kichua, and Shuar nationalities, and 13 sectors of affected farmers throughout the provinces of Sucumbios and Orellana. As the leader of “Toxic Tours” of the oil spills, Donald personally knows the majority of people affected by oil contamination, and the property owners whose land is affected, which will be very helpful as we find sites for remediation projects. Donald has been working towards cleaning up the oil for over 15 years, and we look forward to doing some amazing work together. Above: Grandmother and granddaughter (9 years old) from a Women's Coop participating in a mushroom cultivation course with CoRenewal. Our fungal research station is located in Lago Agrio, a small town close to the oil spills we intend to clean up in Ecuador. It is being used to refine our sustainable mushroom cultivation and mycoremediation methods, and support food sovereignty in the region. 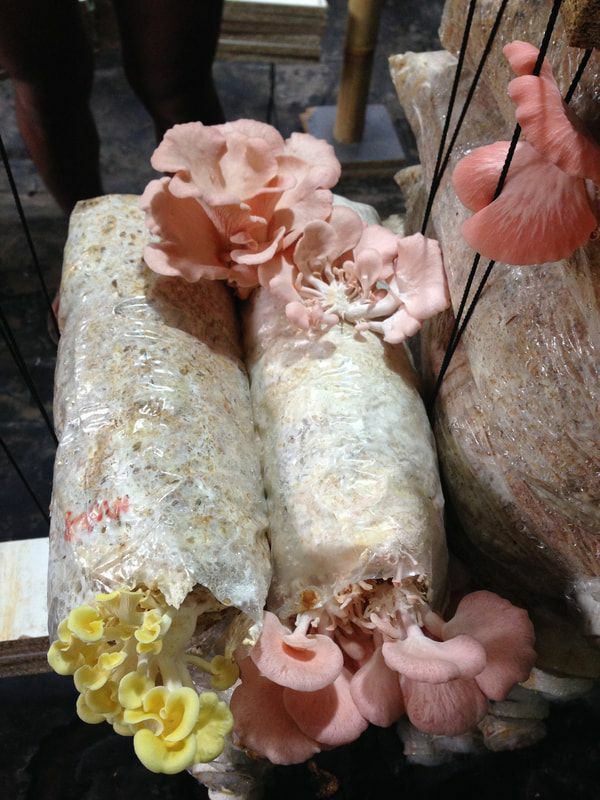 We are experimenting with growing mushrooms on agricultural waste products, and studying species of mushrooms with potential for mycoremediation. 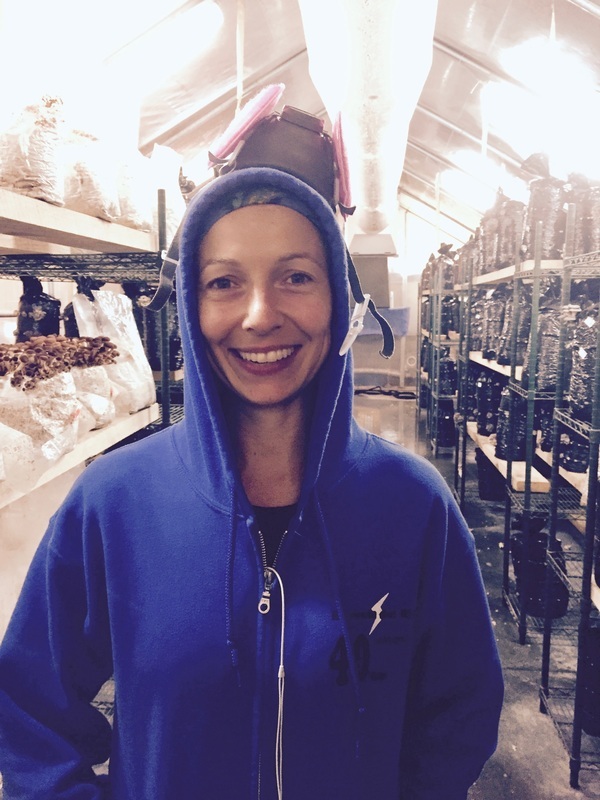 We also provide fresh edible and medicinal mushrooms to the local community and teach locals, including a women’s coop how to grow their own mushrooms. Decomposing the old, bringing in the new! It is my great pleasure to catch you up on some of the exciting things that CoRenewal and Amazon Mycorenewal Project have been up to lately. We’ve been busy growing our organization, designing new research initiatives, creating collaborative opportunities and healing the Earth. The last couple of years have brought many changes to our organization, and some new and exciting opportunities. Last year, we began the process of revising our organizational structure to better support growth in new directions, while increasing our efficiency and effectiveness. We gained additional members and welcomed some amazing new people into our organization. Part of this transition includes the consolidation of CoRenewal and the Amazon MycoRenewal Project into one entity. CoRenewal is the name of our 501c(3) non-profit organization, which has the broader mission of fostering education, research, ecological restoration, sustainability and community health. Amazon MycoRenewal Project, a fiscally sponsored project of CoRenewal, has been engaged in community development initiatives and research on remediating oil pollution in the Sucumbios region of Ecuador for the last 9 years. Because there is so much overlap between the two groups, and we do more than just mycorenewal, we decided to transition towards solely using the CoRenewal name. Our most recent achievement is the implementation of our flagship biofiltration installation for the Municipality of Cascales in the Sucumbios region of Ecuador. Biofiltration is the use of plants, microbes and fungi to filter contaminated water. Using CoRenewal member Robert Rawson’s IOS-500 bacterial blend, biochar, and other innovative approaches to environmental clean-up, we filtered contamination from sewage water, butcher waste, and landfill deposits. Before our intervention, all of these contaminants leached directly into the nearby rivers without any type of filtration--impacting downstream wildlife and poisoning water sources for local inhabitants. Currently, a majority of municipalities throughout Ecuador have similar practices of dumping their city wastes directly into the river without any treatment or filtration. To motivate more municipalities to install similar biofiltration systems throughout Ecuador, we have presented our work, and met with other organizations interested in emulating this project. In addition, we created educational courses on sustainability for local communities to “reduce, reuse, and recycle”, and to reject plastic bags, plastic bottles, and other various disposable items. Our recent bioremediation project in Cascales was a big step towards cleaning up oil contamination in the region. Our next step is to do a pilot project with IOS-500 on an oil-contaminated site; we plan to study the efficacy of these biological treatments, and evaluate strategies for cleaning up the massive oil pits that cover the Succumbios region in Eastern Ecuador. We are currently building collaborative relationships with other organizations in the region and seeking funding for this project. Although we are very excited about using bacteria to clean up oil, we haven’t forgotten about the incredible fungi that originally inspired this organization and continue to motivate our efforts. :) After having limited success with fungi that have proven to be effective at cleaning up oil spills in North America, we are now focused on identifying local native fungi that are already doing the job in the Amazon rainforest. So we are doing fungal enzyme assays to identify and charactarize native fungal communities. We are currently putting the finishing touches on the project design, building relationships with universities and allied organizations, and seeking funding for this project. We also recently built our own mushroom lab and production facility in Eastern Ecuador. We now have the capacity to grow fungi for the purposes of bioremediation and study the efficacy of various fungal species and mycoremediation techniques. With this lab and cultivation space, we are also able to teach local community members how to grow culinary and medicinal mushrooms as a form of sustainable income. We are incredibly grateful to everyone who has given their time and energy to this project over the years, to everyone who has shown interest in volunteering, everyone who has reached out to network with us, and everyone who has has expressed their support. We are not always able to integrate every volunteer, but we always love connecting with new allies. In these times of large-scale environmental racism and unchecked corporate greed, we find that our power to create resilient, positive change depends on these networks of solidarity and mutual aid. We invite you and your friends to join us as a donor, volunteer, or even just as another social media contact. We invite you to support us in this very real challenge to combat and rectify the environmental injustices in Eastern Ecuador. Every contribution makes a difference and is immensely appreciated. Together we can heal toxic wounds and support sustainable and just livelihoods in the Amazon rainforest and around the world. Let us decompose that which no longer serves the greater good, and create fertile ground on which new life can grow. ​Rebecca has been an incredibly helpful new volunteer--working with the fundraising committee on grants, crowdsourcing, the website, and more! Her skill and time go along way towards supporting our mission, and bringing our ideas to reality. How would you summarize your background in one sentence? My education is in conservation biology and agroecology and I've worked in the fields of environmental science, environmental education, and agriculture (now fungiculture). What drew you to CoRenewal, and why did you decide to work with us? Contributing to CoRenewal's fundraising efforts is a great way to remotely support mycoremediation research and development of open-sourced biofiltration & remediation technologies for the global community. I feel grateful to support CR's important research & project work which empowers locals to participate directly in the process of healing their watersheds & communities. Big thanks to Rebecca for all her contributions! CoRenewal Member Robert Rawson has been working with a blend of bacteria trade named IOS-500 since 1991. The technology has proven to be an environmentally safe, practical, and cost effective method for quickly growing and sustaining large numbers of inexpensive, non-pathogenic bacteria that eat petroleum and perform other beneficial environmental functions. Of all of the types of bioremediation out there, we’ve decided that working IOS-500 holds incredible potential for cleaning up oil spills in Ecuador, and are planning a pilot project to do just that. Our biofiltration installations in the Municipality of Cascales have evolved into a far more intensive and exciting project than we initially anticipated. We have directed our efforts over the last 5 months towards expanding this project. We’ve embraced our role as consultants for the local municipality and thus aim to investigate solutions for treating point-source contamination, such as: sewage water, butcher waste, inorganic landfill deposits, and organic compost. Prior to our consultation, all of these point-source contaminants leached directly into rivers without any type of filtration. This impacted ecosystems by overloading rivers with excess nutrients, characterized by extremely high biological oxygen demand. This has been detrimental for wildlife downstream, as well as poisoning bathing sources for local community members. CoRenewal has provided the Municipality of Cascales with biological treatments for these point-source contaminants. Furthermore, we have proposed opportunities for generating new sources of income via repurposing waste products by producing and selling organic compost, woodchips and mulch. In addition, we hope to purchase a machine that can fabricate durable building planks made from waste products, as well as develop a local deposit center for batteries and electronics. Moreover, we plan to continue offering educational courses on themes related to recycling. As we educate local people to reduce, reuse, recycle, we encourage our community members to reject plastic bags, plastic bottles, and other various disposable items. We are grateful for this opportunity to work with the city of Cascales, at the core of its planning and processes. We are confident that our contributions will benefit the ecosystem and the municipal practices within Cascales. A majority of municipalities throughout Ecuador have similar practices of dumping their city wastes directly into the river, without any treatment or filtration. Fortunately, as a result of annual municipal conferences, every municipality in Ecuador is exposed to practices performed by other municipalities throughout the nation. Our collaboration with the municipality of Cascales has the potential to be replicated in other cities throughout Ecuador because it is a promising, inexpensive, and effective biofiltration system. In January of 2016, we put our focus into supporting the collaboration of AMP’s co-founder and bacteriologist Robert Rawson, president of International Wastewater Solutions and patent holder of the IOS-500 bacteria. With over 40 years experience in wastewater management and over 30 years experience in bacterial bioremediation of petroleum contaminated soils, Rawson has been a pivotal player in the development and implementation of bioremediation solutions on the municipal level in the city of Cascales, Ecuador. The same bacteria that is cultivated on-site at the Cascales landfill are the same species that Rawson has had international success using in bacterial remediation of petroleum contaminated soils and waters. So essentially, the “compost tea” made on-site has the dual benefits serving as a biological filter for the landfill runoff, as well as the inoculum for the pilot projects of IOS-500 in Sucumbios. We are currently in the process seeking funding to support the local training, labor, and equipment to move forward with this pilot project in the Ecuadorean Amazon. In Image 1.,The city’s sewage settling tank (#1) was already in place, collecting black waters from the cities population of 14,000 inhabitants without any type of filter before discharging into the river. CoRenewal implemented sand and rock physical filters (#2) that then pass the leachates on to the IOS-500 biological bacteria nursery tanks (#3), where the nutrients and pathogenic bacteria are digested, and then passed through the final touch of a physical biochar filter before entering the river. The leachates leaving the landfill (#7) are exposed to the IOS-500 bacteria at the revision box (#4). To increase retention time and and oxygen these combined leachates are passed through a settling tank (#5), re-pumped over a biological trickling filter (#6), and passed through the final touch of a biochar filter before entering the river. Image 2. CoRenewal members alongside Manager of Cascales’ Landfill working together to build bacteria nursery tanks on-site. With our proposals, the Municipality of Cascales has a pending order to buy an industrial wood chipper to provide a carbon source to the high nitrogen butcher pits full of blood and carcasses, as well as sell mulch and woodchips as a side product. To take it even further, what were once waste products are now used as nutrient rich food to augment the bacterial populations of the IOS-500. They have also made the order to buy a machine, fabricated in Ecuador, that converts the plastic waste products into durable building planks (http://americancierraequipment.com/). CoRenewal members have taught the municipality how to make Biochar on-site to provide the final filtering touch on all discharge tubes. Biochar can also be a selling product for home water filters. Maintenance suggestions have also been provided for the city to create its own fertile, organic compost from city organic waste separation. The applications of the IOS-500 bacteria that are now being produced from the landfill leachates are numerous. International Organic Solutions Inc, with the leadership of CoRenewal board member Robert Rawson, has used this bacteria for wastewater management, bacterial remediation of petroleum, and many agricultural applications in many countries. More information can be found at http://ios500.com/. Corenewal is currently seeking funding and planning for the next chapter with the IOS-500 bacteria. We plan to apply what we know about bacterial remediation and IOS-500 for a pilot project in the Sucumbios region of Ecuador.